George H.W. Bush lies in state at U.S. Capitol. December. 05, 2018 07:53. by Taek Kyoon Sohn sohn@donga.com. “I wish you many C.A.V. U. days ahead.” This is part of a handwritten letter sent to Michael J. Pence, the eldest son of U.S. Vice President Mike Pence, from former President George H.W. Bush, who passed away Sunday at the age of 94. 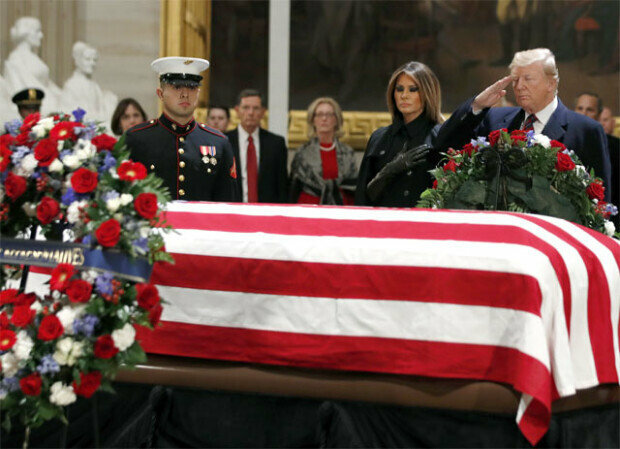 The flag-draped coffin of the 41st U.S. president left his house in Texas and arrived at Capitol Hill at 5 p.m. Tuesday. During his tribute, Vice President Mike Pence shared a story of the late president writing a note to his son after he made his first tailhook carrier landing on the aircraft carrier George H.W. Bush. The C.A.V.U. stands for "Ceiling and Visibility Unlimited," a NAVY acronym meaning clear skies for a flight. Vice President Pence said that it was the USS George H.W. Bush, which his son made his first tailhook landing as a Marine aviator. “That may well describe the essence of this man, and it may well have been his vision," Pence said. "The vision he had for his life, for his children, his children's children and his country. No barriers, no boundaries, no limits." Bush joined the Navy as an aviator on his 18th birthday, six months after Japan attacked Pearl Harbor. He completed 58 combat missions during World War ll and was awarded three Air Medals for acts of heroism. In his 11-minute speech, Mike Pence praised Bush’s achievements as a Navy aviator, representative, U.S. ambassador to the UN, head of the U.S. liaison office in China, and director of the Central Intelligence Agency (CIA). George W. Bush, the eldest son of H.W. Bush, couldn't hide sadness as he watched his father carried by a joint services military honor guard into Capitol Hill. His wife Laura sat next to her husband during the 40 minute memorial service, holding his arm tightly. The Lincoln Catafalque, where Bush’s casket was put on, had been first used for Abraham Lincoln’s funeral in 1865. The last state funeral for a former president was that of Gerald Ford, which began in December 2006 with a lying in state and service at the U.S. Capitol. Capitol Hill will be open to the public until at 7 a.m. Wednesday. The Christmas lighting ceremony, which was scheduled for the day, was put off by one day. After the funeral, Bush’s casket will be laid in state for a day at St. Martin’s Episcopal Church in Houston and will be buried at the George Bush Presidential Library and Museum in Texas next to his wife Barbara Bush and his daughter Robin.